I have a nostalgia for home-made and improvised gear. Probably a romanticised idea of times past when there was only one carabiner shape and problems were solved with knotted tape slings, prusiks, and knowledge. Having that knowledge to devise eloquent solutions was/is cool. Sadly now prusiks are replaced by numerous rope grabs; yes, safer better on wet/iced rope bla bla. Of course everything has evolved and is now: lighter, slick, purpose-built, tested to standards, colourful, and supper safe if used correctly. Though I quite like the ‘hacks’ of this new gear to bend it to other purposes, this implies you really know what you are doing and that there is some precedent for that use… in climbing it’s a kind of natural selection I guess. I’m thinking of the Grigri adapted for self belay (not recommended by risk adverse manufacturers): are you brave/confident enough to drill a hole in your Grigri? So I’m going to risk it with my piton. I’ve got an aid climb project I’m self belaying on. Simple clove hitch set-up which needs a solid base anchor. This particular climb (my Dusk Wall Project) has nothing solid for an anchor close to the base but the flaring crack of the climb. 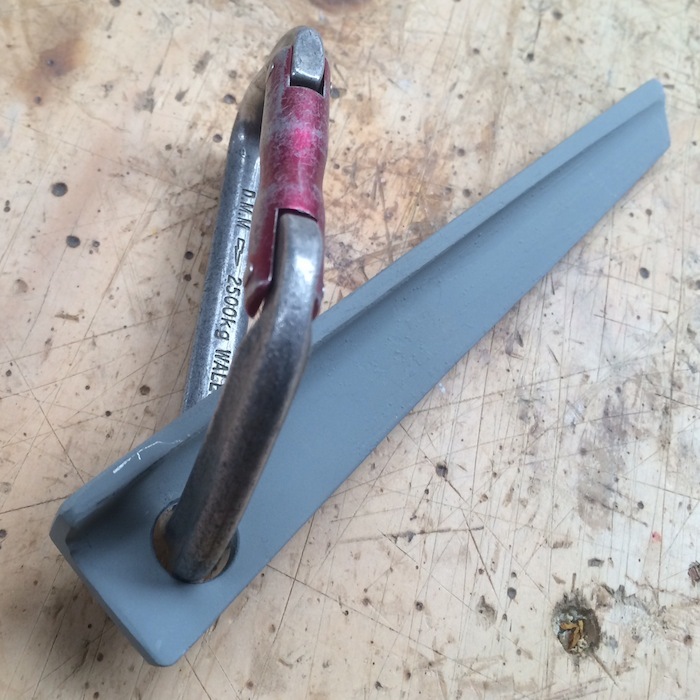 On day one of the project it took me ages to build a multi-point anchor that I wasn’t really happy with, so I’ve decided to incorporate a piton at the base of the climb. Will put it in right at ground level and bury it so as not to offend anyone but have it handy for my attempts. I’ll have it backed up with at least two other placements but these are marginal given the flaring nature of the crack and the angle of pull in a fall. I’ll be nervous and incorporating higher placements into anchoring the rope I suspect. Really I use rated / manufactured gear for all the critical stuff, but one reason I like aid climbing is that there is still room for home-made gear, in that a lot of it is “body weight only” stuff that is not critical in your safety set up. I’ve made my own ladders and a belay seat, these are plenty strong enough and designed to my purpose. I’ve seen some great home-made aid climbing gear, perhaps from a time when there wasn’t so much commercially available. I love this idiosyncratic stuff; compare it to a rig of purpose-built gear — sure you have the consumer skill off selecting / affording the right stuff but it’s often a choice between compromises. And where is the achievement in setting up a tight rig. I got to thinking about this reading a four-wheel drive magazine waiting with my son at the doctors. The set-ups on offer (vehicle/trailer/tents etc) where tidy, robust, and light but I felt there was something individual missing, these where someone else’s solutions and “productised”. My last motorbike had very nice bolt-on solid panniers, water proof, lockable, convenient, but I still loved the previous bike and rig I rode around Australia with: home-made canvas bags lashed on, a canvas water bag, and home-made aluminium frame petrol carrier; all evolved through months of travel… I digress, it must be my age! What do you think about my piton, am I going to die?